3% cashback for travel, 2% for dining purchases is good for a travel card. This rates are unlimited. You won't want to pay foreign transaction fees if you travel abroad very often and you are not going to pay those fees with this card. Balance transfer fee is good with 3 percent. Cash advance fee is fair. It is 4%. You won't pay the annual fee in the first year. There are many good features for travelling. If you are travelling very often and if you would like to have a travel credit card for that, this is one of those options for you. 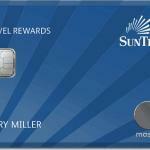 You are going to earn unlimited cashback as much as you can with SunTrust Bank Travel Rewards Credit Card. The card is providing reasonable interest rates for purchases and balance transfers. Cash Advance APR is high though. The other upside of the card is foreign transaction fee. If you are visiting abroad very often, no foreign transaction fee feature of the card is going to help for saving more money. You don’t need to pay Balance Transfer APR in first 15 months. This introductory APR will help you for balance transfer freely except regular fees. Regular fee is 3%. 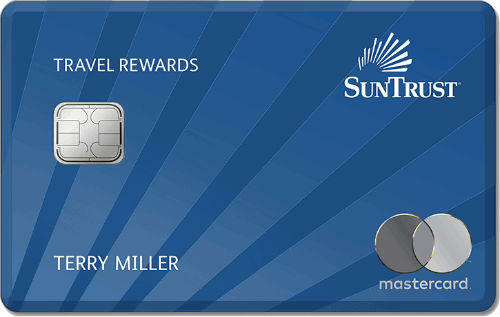 You can find rates of SunTrust Bank Travel Rewards Credit Card below. You can also read user reviews and editor scores. Regular: 13.24%–23.24% 3% cashback on travel purchases. 2% cashback on dining purchases. 1% cashback on all other purchases. First year waived.